Review the entire 2007 Schedule and Results HERE!!!! because we were looking at the spot where the Cat Walk was last year. But, then we turned the corner and we were amazed. The Cat Walk was 10 times bigger than it was last year. but when we saw that line of fans we knew Big Blue was back. I can say that the Cat Walk was special to me, because it is my last one. by giving high fives and everything. that just wanted a good football team. The New York Times Recognizes The Hard Work Is Paying Off! at Commonwealth Stadium in 3 OTs. Hear Andre Woodson's post game comments here. Take the Field to gain the early advantage in the SEC East 2007 race to Atlanta. Heisman Trophy candidate Andre Woodson has Kentucky off to a surprising 5-0 start, but games against South Carolina, LSU, and Florida will be better indicators of just how good the Wildcats are. NEXT YEAR MAY HAVE ARRIVED!!!!!! DALLAS (FWAA) -- With their 42-29 win over at Arkansas, the Kentucky Wildcats (4-0) are the Tostitos Fiesta Bowl National Team of the Week for games of the weekend of Sept. 22. 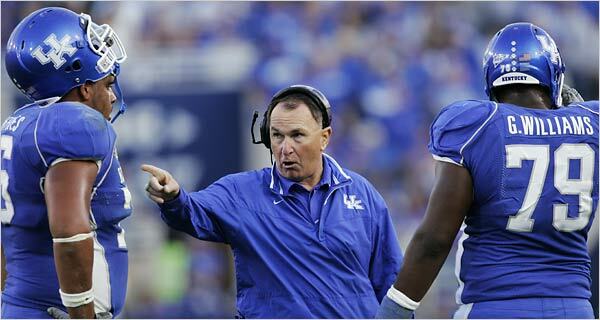 For Decades, UK Football Fans have always dreamed and hoped that "Next Year" will be better for the Cats. 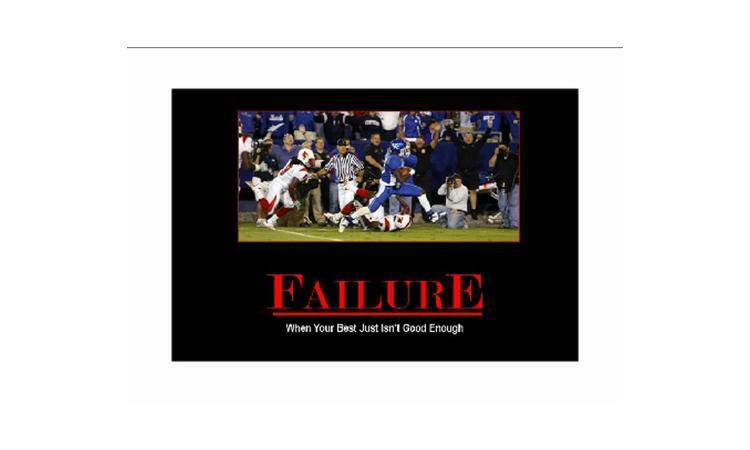 In 2006, the Wildcats turned around their season, indeed the program, following an embarrassing defeat to the LSU Tigers in Baton Rouge, Louisiana. Since that fateful Bayou night, the Cats are 9-1, with their sole loss being to Tennessee, 17-12, to end the 2006 regular season. However, 2006 was the "Next Year" that Ryan Parker sings about and culminated in a bowl victory, 28-20, over Clemson, and a 3-0 start in 2007. 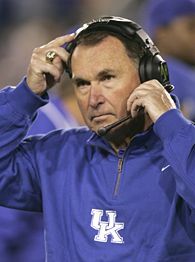 The third win of the 2007 season ended the recent dominance of the Cats by intra-state opponent, Louisville, and maintains the Cats' overall series control over the Cardinals, at 11-9. 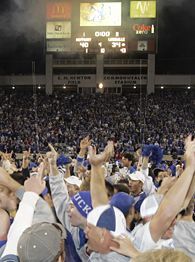 On September 15, 2007, the Kentucky Wildcat football team defeated #9 Louisville Cardinal team in a battle for state bragging rights and pride that was decided on a 57 yard Kentucky touchdown pass to secure a 40-34 victory. This was Kentucky's first victory over a team ranked in the top 10 since 1977, and the first such win at Commonwealth Stadium since 1974. Quarterback André Woodson has been selected as the College Player of the Week by The Sporting News and the Southeastern Conference Offensive Player of the Week by the league office for his play in Saturday's 40-34 win over Louisville. 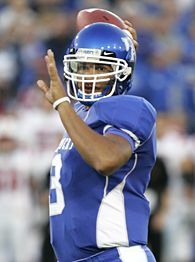 Editor's Note: Andre Woodson is 14 shy of the all time national record for consecutive throws without an interception. On Saturday, September 22, 2007, Woodson will certainly have that many opportunities, and a chance to add his name to a record that may stand for many years. As June 2007 winds down, summer begins, Wildcat fans are focusing on the upcoming football season. 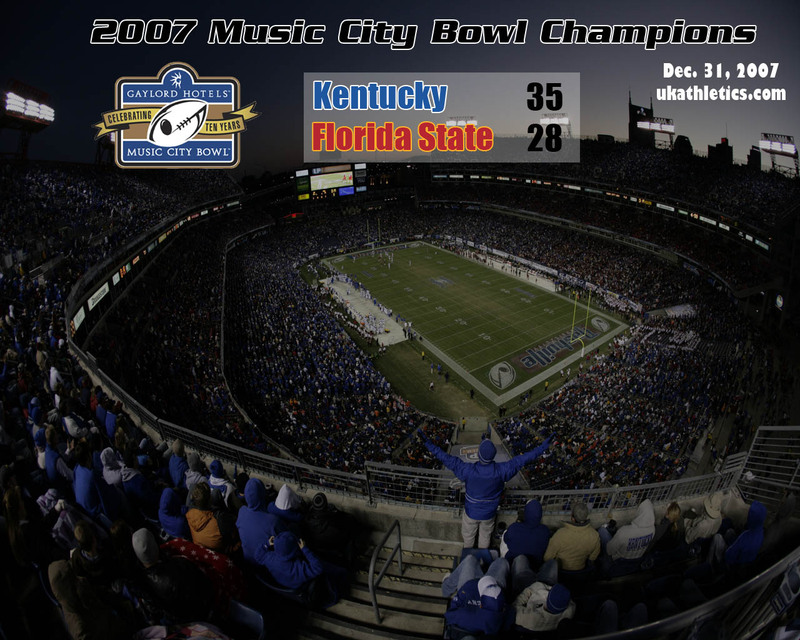 The Cats are coming off a successful 8-5, Music City Bowl victory, and fans have high expectations for the 2007 season. Perhaps fan expectations are as high today about football as any time in recent history, and certainly since the days of Tim Couch. for 3,515 yards and 31 touchdowns. Rivals.com provides a complete analysis of the Cats. LINK!!!!! Track the Cats through the 2007 Season here.